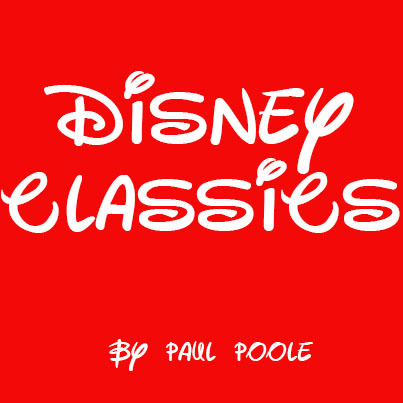 I am so excited to share that my friend, Paul Poole who has a wealth of knowledge regarding Disney Classic films and shorts will be contributing some posts to the blog. He has some great information about the history of Disney cinema and I am happy to welcome him to the Winnie the Stew team! I know you will enjoy Paul’s posts as much as I do and I encourage feedback for future postings! As a child lucky enough to have the Disney Channel back in the early 80’s, I’ve come to feel very fortunate. You see, I remember a time before The Little Mermaid. Back then without loads of new merchandise driven animated “Masterpieces” and “Classics”, we were treated to multiple decades worth of Disney History. Vintage Mickey Mouse Club, Zorro and of course lots of vintage theatrical shorts. Y’know, DISNEY CARTOONS! On the Disney Channel? Yeah, hard to believe! The point of this, hopefully the first of many articles on the rich history of a Disney long before little girls (and boys….and their parents) went around singing “Let It Go” at the tops of their lungs, is to share some Disney magic! This first rambling feature will focus on Walt Disney’s “American Legends” type of output. Just the cartoons. I could be here all day discussing Zorro, Davey Crockett, Swamp Fox and the Reverend Dr. Syn. Since these cartoons don’t package quite as nicely as the Mickey, Donald and Goofy shorts, they can easily fly under the radar of the casual Disney fan. This is a shame since they’re a lot of fun! Note: If you are interested in adding any of the following animated classics to your home DVD library, click on the title to be redirected to Amazon. CASEY AT THE BAT (MAKE MINE MUSIC): Based on the 1888 poem written by Ernest Thayer, this 1946 short tells the classic tale of Mudville’s favorite ball player. A segment in the “Make Mine Music” film, and narrated by the distinctive voice of Jerry Colonna, this great old timey baseball story evokes Walt’s love of “Mainstreet U.S.A.”. To say anymore would spoil too much. JOHNNY APPLESEED (MELODY TIME): Walt Disney’s 11th animated film, “Melody Time” was released in 1948. The next two shorts I’ll discuss called this anthology film, home. Johnny Appleseed tells the story of real life, John Chapman. John Chapman traveled the frontier planting apple trees with only himself, a pot for a hat and his bible. Quite a delightful story with good messages for us all. What sets Johnny apart from the others on this list? He’s no obvious hero. He’s small, lanky, timid and makes a point to never hurt an animal. A historical side-note… The type of apple the real life Johnny planted were generally considered too bitter for good eating. They did however make fantastic hard ciders and adult beverages. Admit it, Johnny Appleseed just got a lot cooler in your book. He brought booze to the pioneers! PECOS BILL (MELODY TIME): Also appearing in Melody Time, Pecos Bill tells the story of a man who was, “quite a cowboy down in Texas. And the western Superman to say the least…”. A raucous, fun tale told and sung by Roy Rogers and the Sons of The Pioneers. An orphan raised by coyote’s, Bill grows up to be truly the West’s Superman. From riding tornadoes to creating the Gulf Of Mexico, Bill has done it all. Alongside his best friend and trusty steed Widowmaker, Bill easily stands shoulder to shoulder with any other hero of tall tales and legends. That is until a beautiful catfish-riding cowgirl comes between Bill and his jealous horse. Sadly this is no longer available in an uncensored form. What’s so offensive to Disney? The portrayal of Native Americans? No, that appears to be OK. Bill’s enthusiastic love of the second amendment? No, lots of gun-play in this. So what then? In a 1948 cartoon about an 1800’s cowboy, Pecos Bill has the nerve to…gasp…smoke. Yep. One verse of the song has been completely removed showing him casually rolling a cigarette while lassoing a tornado. They’ve even digitally removed a smoke from a later scene leaving the casual viewer wondering why Bill’s mouth looks “off”. Seriously. That’s right kids, your parents may smoke. Someone in your family may smoke, but by golly a cowboy from over a hundred years ago MUST be censored. Unedited versions can be found easily on YouTube. THE ADVENTURES OF ICHABOD AND MR. TOAD: As J. Thaddeus Toad’s story is very British, we’ll leave his segment of this 1949 film for another time. The Disney studios’ 11th feature film adapts Washington Irving’s classic, “Legend Of Sleepy Hollow” into animated form. Probably the most well-known of these, this classic became a Halloween regular on TV. You know the story… schoolteacher Ichabod Crane’s late-night encounter with the legendary Headless Horseman, who frighteningly turns out to be all too real for the cowardly pedagogue. Narrated, voiced and sung by the great Bing Crosby, this one has a lot of fans. Every one of them well deserved. If you haven’t seen this, good lord! Do so! If it’s been a while, treat yourself to another viewing. THE BRAVE ENGINEER: Jerry Colonna narrates and sings this 1950 cartoon about the legendary railroad engineer, Casey Jones. Determination is the theme of this classic short, as nothing, not outlaws, floods,cows or other trains will stop the famous Casey Jones from delivering the western mail on time (Almost)! BEN AND ME: Based upon the book of the same name, Ben and Me tells the story of how the famous Ben Franklin met the not at all famous, Amos Mouse. The interesting part of this 1953 cartoon is that Amos Mouse is actually the one responsible for all kinds of Ben’s famous inventions! Of particular note to classic Disney fans, listen for Disney veterans Sterling Holloway as the voice of Amos, and Hans Conreid as Thomas Jefferson. You know them better as Winnie The Pooh and Captain Hook. CASEY BATS AGAIN: Disney returned to Mudville in 1954. Taking up shortly after “Casey At The Bat”, this time it’s up to Casey’s daughters to redeem his name. If you’re a fan of A League Of Their Own, you may enjoy the women’s ball team’s story. For every guy who kept trying for a son, this one’s for you. Casey ends up with enough daughters to fill a team roster, with himself as manager of course! PAUL BUNYAN: This 1958 short tells the story of the mightiest lumberjack of them all. Voiced by Thurl Ravenscoft, well known for voicing Tony The Tiger and singing, “You’re a mean one Mr. Grinch”, Paul’s voice looms large over the countryside, much like his “Sixty-three axe handles high” stature. From infancy to retirement, you’ll learn his story. Like an American Hercules, Paul creates mountains, straightens rivers, clears thousands of miles from land and all with the help of his giant blue ox, Babe. Paul seems unstoppable until he comes face to face with the one thing none of us can stand in the way of; progress. THE SAGA OF WINDWAGON SMITH: The Sons Of The Pioneers who sang their way through Pecos Bill earlier, returned in 1961 to lend their voices to the tale of Windwagon Smith. This western tale tells of a seaman who decides to ply his trade across the great plains. Building a cross between a wagon and a wooden tall ship and intending to haul cargo faster without horses, Smith sets sail out of Kansas, and into legend. One of the common themes that I find so entertaining about these is the fun musical narration and quick wit about so many of them. Snappy banter and classic themes make these fun for all ages, but especially with older kids and parents who tire of Mickey’s sweetness and optimism. They are also all very American. This isn’t a bad thing. For the most part all the Disney Princesses are very European tales. Not surprising coming from their European roots. One thing all kids should learn at an early age is that for most of us, our ancestors came to the United States because they were fed up with Monarchies. In all the Princess films we’re shown that Kings and Queens are nice to have. I guess Snow White would disagree, but I think you get my point. This country was founded by people who couldn’t have disagreed more. Mickey, Donald and Goofy are very classic “American”. Optimism, a dash of irreverence and sarcasm, hard-working, and very “Pull yourself up by your bootstraps” characters. In that sense, Pecos Bill and Paul Bunyan would feel right at home. It’s important to know that Disney tried all kinds of things. While I love most classic Disney, a step away from the intersection of Mickey Mouse and Cinderella can be a very rewarding journey. Don’t be afraid to seek out Disney’s Old West, Colonial America, or mid-western ballparks. You might just fall in love with Disney (and the USA) all over again. This entry was posted in Disney Characters, Disney Movies, Uncategorized and tagged Disney, Disney Channel, Disney Classics, Johnny Appleseed, Make Mine Music, Melody Time, Pecos Bill, Walt Disney, Walt Disney Company. Bookmark the permalink.